A late rally from England's Katherine Brunt could not prevent Sydney Thunder from beating Perth Scorchers to reach the final of the inaugural Women's Big Bash League. Set 119 in Adelaide, Perth began well through Elyse Villani (23) and England captain Charlotte Edwards (18). 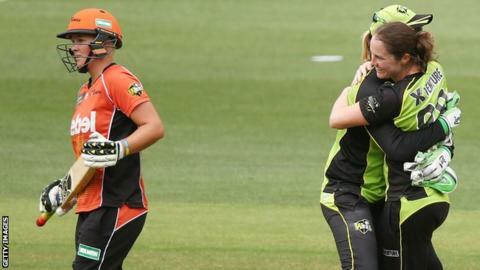 But Brunt was trapped lbw for 18 from 20 balls in the last over as they ended on 110-9, losing by eight runs. Hobart Hurricanes face Sydney Sixers on Friday for a place in Sunday's final. Hurricanes skipper Heather Knight and Sixers all-rounder Laura Marsh are the only England players left in the competition, although Marsh is not in the Sixers' 13-strong squad for Friday. Thunder - the only Women's Big Bash team without any England internationals - were indebted to captain Alex Blackwell (39) and West Indies opener Stafanie Taylor (24), who helped them post 118-6 in 20 overs. Thunder's Australia seamer Rene Farrell held her nerve to take two wickets in the final over of the match - Brunt and ex-England all-rounder Nicky Shaw - to finish with 3-20. Meanwhile, Thunder's male counterparts also reached the final of the men's Big Bash League, beating Adelaide Strikers by eight wickets.